Being told that your dog has cancer is of course devastating, but it’s not necessarily a death sentence for your dog. With proper care, lots of TLC, your dog could still enjoy good quality of life and have many best days of his life yet. 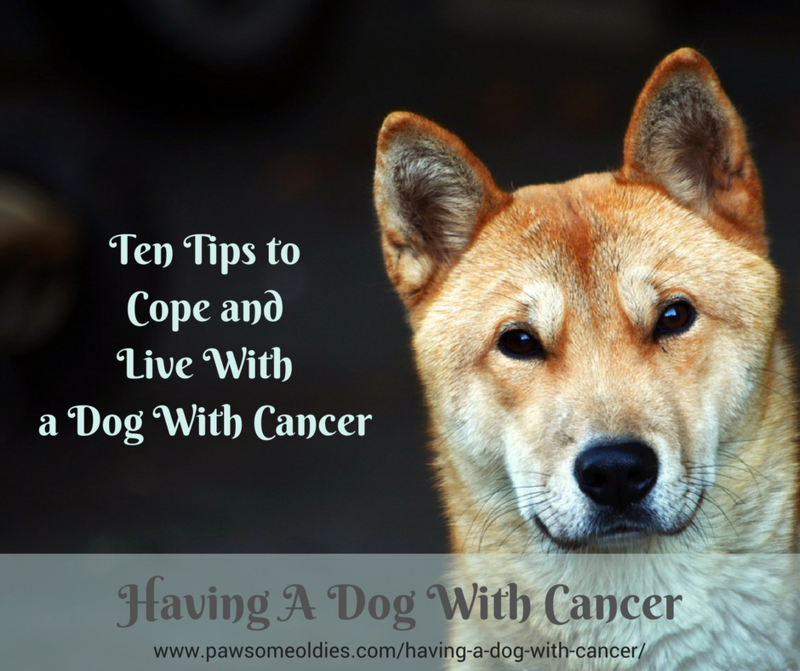 This post gives you some tips on how to live with a dog with cancer. By that I mean make sure you have a team of competent medical professionals (vet, oncologist, herbalist…) that can offer you helpful advice, tests, and treatment. This can make a huge difference, not only on your dog’s health and wellbeing, but also on your own sanity! Develop a good rapport and trusting relationship with your medical team. Having a vet who is competent, compassionate, and caring (one who has the three “C”s) can give you reassurance and peace of mind that your dog is in good hands and is getting the best treatment. If, unfortunately, your vet doesn’t quite have the three “C”s, or if you have doubts in his opinions or diagnosis, don’t feel you “have to” listen to him. It never hurts to get a second or even third opinion. Make every day the best day for you and your dog. Having a dog with cancer and taking care of him can be a busy and stressful task, to say the least. But try to find order in chaos, carve out routine in a seemingly messy life, and enjoy every moment with your dog! Do your best to “act normal” and treat your dog as you usually did before the diagnosis. Don’t worry too much, and don’t fuss over your dog every five minutes! Dogs are very receptive to our feelings and emotions, and if you are worried, he will be too! If you haven’t already done so, dump the bag of dry kibbles and start cooking for your dog. A cancer diet should be high in fat and good-quality animal protein sources, and low in carbohydrates (especially simple carbs) because cancer cells need sugar to grow and reproduce. 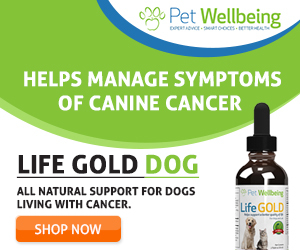 Please read my article on Dog Cancer Diet for more information on this important topic. This is a no brainer. A dog with cancer most likely has to go through lots of poking and jabbing at the vets. Not to mention there will be pain especially if the cancer is in its more advanced stage. Keeping the dog as comfortable as possible is one way to maintain his quality of life. A warm, comfortable bed in a quiet and undisturbed, low traffic area in the house is a must. Make sure that the bed is always clean and dry. It may be a good idea to get an indoor toilet for your dog, especially if mobility is an issue. If your dog has difficulty getting up and walking, use a sling or hind leg support harness to help him get up and walk around. Simply add one-fourth teaspoon of table salt to a cup of sterilized water. (Boil a cup of water to sterilize it and let it cool down). Use a syringe to gently flush out the sore. Then disinfect the sore by gently dabbing the area with sterile gauze that has been soaked in hydrogen peroxide. These natural grooming wipes also come in handy. In addition to keeping your dog physically comfortable, it is equally important to keep him calm and as stress free as possible. All the vet visits and checkups could put a lot of stress on an already sick dog. Therefore, try different ways to help your dog relax. Rescue Remedy: Bach Rescue Remedy is a flower essence that works on the emotional energy level of an animal, and can induce an immediate calming effect on the animal. Add a few drops of the essence to your dog’s drinking water. It is an easy way to help relax your dog and make him less stressed. Essential Oil Spray: You can also make an essential oil spray using calming oils such as Lavender, Roman Chamomile, Valerian, etc. Spray the air around your dog, on his bed, and/or directly on the dog (avoid the face). If you don’t want to make your own spray, try this Only Natural Pet Just Relax Botanical Calming Spray . It contains the essential oils of Lavender and Valerian. Calming Treats: Hey – this one should be a hit for your dog! 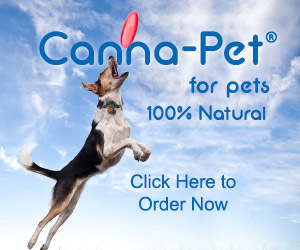 Get your dog some treats that are made with ingredients that have calming effects. Having yummy treats in itself can definitely knock the stress level down a few notches. And with calming ingredients in the treats, your dog will most likely unwind and relax in no time. Depending on the type of cancer, your dog may have to take different medication at different hours. Add to that, you may want to give him supplements, herbs, and so on to help strengthen his body. Keeping track of dosages and when to give what could be a hassle. You could of course use a calendar or a spreadsheet to help you. If you are more of a “techie”, download a medication organizing app such as Pill Monitor to your device to keep track of things. We all know that dogs are stoic and seem to have a much higher pain threshold than we do. So it could be difficult to tell if a dog is in pain or not. Learn to observe and recognize signs of pain in dogs. Also be as mentally prepared as you can: When even painkillers seem ineffective in reducing pain in your dog, then you have to make that final decision so your dog won’t suffer unnecessarily. At my other site’s Dog Cancer Forum, many dog parents commented that they somehow knew by the look on their dog’s face. And very often the dog would just let them know it was time. You know your dog the best, and I think your dog will communicate with you through his eyes, his expressions and his behavior. Be observant and you’ll know. Mother Teresa once said the most satisfying thing for her was to see someone die with a smile on his face. It would be extremely satisfying for dog parents to see their dogs die happy as well! So make a bucket list for your dog. Do awesome things for him, with him. What exciting places can you take him to? Are there any new things that you want him to experience? What kind of yummy food and treats can he try? And don’t forget to take lots and lots of pictures and videos. Make memories so he can live on forever. Try to find an outlet for all these emotions. Talk to a trusted friend, keep a journal, or join a support group. Physical exercise can also help a great deal in releasing all the emotions, which otherwise will be repressed. Go for a run. Do yoga. Or, if you have a lot of anger inside you, consider kickboxing! Whatever you do, be sure not to cry in front of your dog as that will definitely stress him out. If you have to cry, do it in the shower! This is hard, I know, but it is so important to be prepared and have everything organized. Have plans put in place now, so that when “the time” comes, you don’t have to stress over all the decisions that have to be made. Should I ask my vet to come to my house to put my dog to sleep? Should I let my kids witness the passing? What should I say to my young kid who doesn’t quite understand what’s going on? What should I do with my dog’s body? Which crematorium should I use? Should I get his body to the crematorium myself, or should I let my vet do it? Where should I keep his ashes? If you decide to have a private cremation for your dog, do your due diligence and check out the credibility of the crematorium. I was shocked to read this article on how some crematoriums in Vancouver fraudulently returned wrong remains to pet owners. That’s why doing your homework and planning ahead of time is so important. Having a dog with cancer doesn’t mean you have to live every day in fear and despair. Learning how to cope with a dog with cancer takes time and patience, but with some planning and lots of TLC, you can make life for your dog and yourself so much happier and easier! Know that you are doing your best and your dog is grateful to have you by his side as his fighting partner. As always, please do share your experience below. 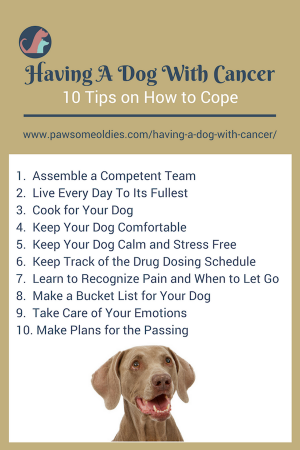 If you have or had a dog with cancer, what are your tips on coping? What advice would you give to other dog parents?